A little while ago I wrote about clutches on this blog and how I’m beginning to warm up to them (you can read the post here). It just occurred to me that I should have probably said pouch and not clutch when speaking about the daytime version (I found the picture here by the way). Since those are most of the time bigger and more pliant, the word „pouch“ somehow seems to be a better fit. But before we immerse ourselves in linguistic adventures, I stop right here and say what was really on my mind: the diy version of a very renown pouch (American Apparel). Apparently you can not only paint your walls the colour you dreamt up, you can do just the same to your bag/ clutch/ pouch. What sounds like a mad idea leads to a stunning distressed result which I really like. This is news to me. How about you? I love DIYs when they just REALLY turn out. Is this the one you made? It’s really neat. 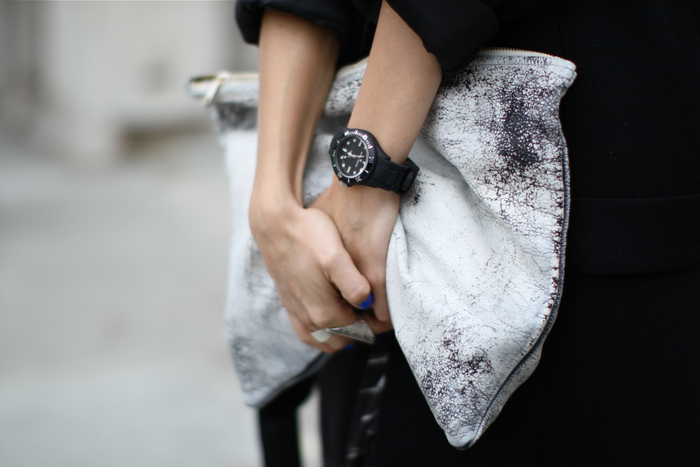 Hi Kate, unfortunately it wasn’t me who transformed the bag into this crackled beauty, but Sandra from 5 inch up (the original post: http://5inchandup.blogspot.de/2011/09/tuesday-at-lfw.html).